Although the new trend in St. Tropez is supposedly “authentic luxury,” the new crop of ultra-contemporary hotels there seem to be out of place. 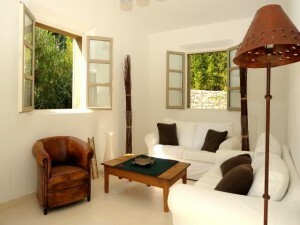 But this luxury villa really combines a modern interior with a traditional exterior for total luxury throughout. Search the web about St. Tropez these days and you’ll come across a lot of coverage about the new boutique hotels that have been appearing there, just in time for the peak summer season. The Muse Hotel has made a lot of news: with its 15 little “villas,” its layout is supposedly a reflection of the trend toward traditional, authentic St. Tropez luxury , much in the way that Bardot discovered it back in the day. But these new hotels are about as authentic and traditional as the Guggenheim Art Museum. The manager of the Muse recently was quoted as saying, “We want to build a brand of boutique hotels that offer refinement and culture and puts excellent Asian service into a French cocoon.” Correct me if I’m wrong, but Asian service — regardless of what you may think of it personally — is most certainly not going to give you an authentic St. Tropez experience. Similar questions can be raised about the other new players in the St. Tropez boutique hotel market: La Réserve Ramatuelle is another contemporary art masterpiece — impressive, no doubt, but about as quintessentially St. Tropez as Disney World. The fact is, luxury villas are the only real option for experiencing St. Tropez the way it used to be. And what’s for, if you still have a thirst for contemporary decor, you can both. Set amid the rugged terrain of the countryside, VillaHotel Imana offers an exquisite blend of traditional French elegance with modern décor and amenities. Private, garden-lined terraces invite you spend your days outside on the manicured lawn or pristine, Olympic sized pool, or entertain into the night with an outdoor barbeque and covered lounge. This luxury villa features large windows and an open floor plan that give you an exceptional view of the gardens, pool, and outdoors around every turn of VillaHotel Imana, while the villa’s traditional exterior design gives way to sleek, minimalist contemporary décor inside. In addition, the living and dining rooms as well as the 4 bedrooms and en-suite bathrooms are all remarkably unified in their furniture and decoration, offering a mix of artistry and comfort. The kitchen and bathrooms all feature contemporary appliances and fixtures that will captivate your senses, while the rest of VillaHotel Imana offers plenty of space and comfort. And because the VillaHotel Imana features Villazzo’s industry-leading VillaHotel services, you get the perfect combination of five-star hotel services with the comfort and privacy of a traditional luxury villa in St. Tropez. So, if you’re looking to experience the authentic St. Tropez holiday, be sure to choose a luxury villa like the VillaHotel Imana — it’ll give you the best of both worlds. This entry was posted on Thursday, July 22nd, 2010 at 5:56 pm	and is filed under Saint-Tropez Luxury Travel. You can follow any responses to this entry through the RSS 2.0 feed. You can leave a response, or trackback from your own site.